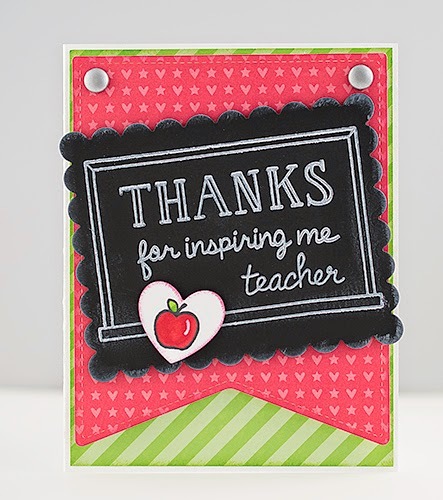 Dies R Us: Teacher's Thank You! Happy Thursday everyone! Robin here with my design of the week for Dies R Us! Have you seen the new die releases? NO!! Well stop by Dies R Us and you can pre-order the latest and greatest dies for 2015! It's always nice to have a few teacher thank you notes in your drawer; you never know when you might need one. This card started out as an A2 white card base and then I added a fun striped paper. The banner is cut using Lawn Fawn's Stitched Party Banner Die , matte silver brads were added to the corners and the banner was added to the card with foam tape. I stamped the chalk board and sentiments (Lawn Fawn) with white ink onto black paper and cut out using Spellbinders Classic Scalloped Rectangles. The chalk board was added with foam tape. The cute heart shape, stamped with an apple, is also from the Stitched Party Banner Die set from Lawn Fawn. Be sure to check out the Dies R Us Challenge Blog for our twice monthly challenges! Lots of fun and you could win a gift card to the shop!